I take the first pitch down the middle. The second one comes in high and fast and I swing from my heels. I want to blast it out of the park and tie the game up. But, I come up with only air and the momentum from my swing throws me to the ground. I climb to my feet, dust my self off, take a couple of cuts, and step back in. The pitcher winds and fires. This time I connect, sending a liner into the gap in right-center. I’m rounding first as the ball rolls to the fence. I stroll into second. The fans cheer wildly and my teammates go crazy in the dugout. I tell myself nothing will keep me from scoring if only our next batter can just get a hit. The pitcher glances my way then goes to the plate. Our batter gets just enough to send a looping pop fly to shallow right and I’m on my way. I hear the crowd roar as I round third. I know the ball has fallen for a hit. About half way to the plate the pain hits and I remember the dog. In those days I was not only a baseball player, I was also a newspaper boy. Two days before the game, as I walked from my bicycle to the front door of a customer’s house to collect for the paper, a large grey dog with fiery yellow eyes charged and bit me on the rear. Fortunately, the dog’s master was not far away and was able to call the vicious animal off. Otherwise, I would have died then and there. Maybe that would have been better. “Slide!” I scream to myself as I close in on home. But it hurts so much I can’t. I come in standing up and I’m tagged out. The game ends and we lose. I walk slowly to the dugout. Our coach’s head is down and my teammates are crying. I burst into tears. Maybe if I slid we would have won. Today, all these years later, the question still lingers in my mind. But I didn’t and we lost. Lousy, no good, dog. I’m visiting my brother, Hollywood’s most esteemed theatrical producer, and man-about-town, Gary Guidinger, and his wife, Linda Toliver, at their place in Frogtown near Los Angeles’ Griffith Park. It’s a blue sky, Southern California morning. We’re in the living room drinking coffee, eating oatmeal, and reading the LA Times. I’ve got the sports section and I’m checking out World Baseball. Four hours later, the three of us head out. We hop on the 5 north for a brief moment before taking the 2 to the 134 to the 210. Our route will take us east of LA, all the way to the 57, before heading south to Anaheim Stadium where Japan and Mexico get it on at 4. It’s around 2:30 and, as any Angeleno knows, traffic is about to set in, thus the circuitous route. Gary’s in command of the black A8 L Audi. Coming into Pasadena I point out Suicide Bridge to my right. “Maybe they should call it something different,” comments Linda. She’s from New York. Gary and I both grew up in LA, so we don’t say anything. I’m always saying that knowing LA is an advantage in life. I mean, can you imagine coming to such a place and trying to make your way around in some ridiculous looking rental car? LA’s got cool; it’s big and mean to a newcomer. It takes years to figure out. We were born here. Gary still lives here. That’s an advantage. When Bob Dylan’s Masters of War finishes up I switch from CD to radio mode and scroll to 1150 AM, home to Air America in LA. Air America Radio is where Americans still in possession of a brain spend time and get riled up over Bush and his cronies and the unbelievable trip they’ve laid on the United States and the rest of the world. Randi Rhodes, the Air America host, is going on about the Al Qaeda-linked Moussaoui trial and how the judge is tossing out testimony on airplanes due to witness tampering by an overzealous prosecutor. Moussaoui’s been found guilty of not doing anything to stop the 9/11 attacks and now they’re in the death penalty stage. Moussaoui sounds to be an emotionless zombie who perhaps deserves to be stuck away forever; however, I’m one of an apparent minority of Americans who’s against the death penalty. I believe we, as a sophisticated society, need to set a better example than an eye for an eye. Let ‘em rot, throw away the key, but don’t stoop to their level. If Moussaoui’s guilty because he knew 9/11 was gonna happen and he did nothing to stop it, then how come Bush, Cheney, Rice, and all the others who knew Al Qaeda was coming after our planes, our buildings, and our people, and did nothing to stop it, are not also on trial? 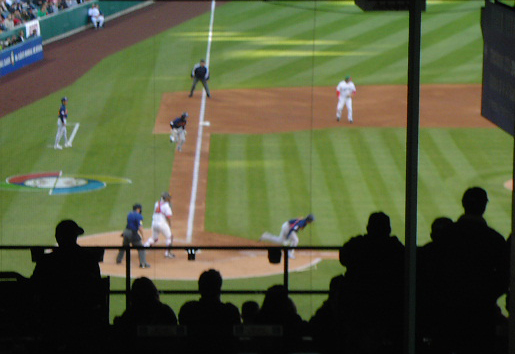 On cue, Anaheim Stadium rises on the horizon and returns our reality. At my urging we grab a parking spot way out. My theory is if you don’t mind walking, parking ceases to be a problem. My brother whines before the excitement of the game takes over and we’re striding to the ticket booth. Gary forks out $27.00 a piece for three tickets and just like that we’re in. No matter what the future has in store, we are forever linked with the first-real World Series. My hand cradles a steaming hot dog covered in mustard as I make my way behind the Japan Team dugout. Right off I’m impressed by the uguisu-jo. For those of you who have no idea what an uguisu-jo is, she’s a female stadium announcer speaking Japanese. Yakyu, what Japanese call their baseball, and an uguisu-jo. Hot dog & mustard. I’m where I want to be. My eyes find Sadaharu Oh. The man is a legend in baseball minds throughout the planet and this is my first chance to see him in person. In 2003, in North Carolina, I spent 10 days watching my son and his Wake Forest Demon Deacons go through their fall workouts. While there I read Oh-san’s biography. I picked it up thinking I’d learn something about the Tokyo Giants’ player with 868 career home runs and I finished in the comfort of having read a great book. Sure it’s baseball and all that. But, it’s a lot more. Oh-san liked his good fortune at the plate and his good times around town. In another time, Shigeo Nagashima would be coaching Japan Team and Oh would be at home with his Hawks in Fukuoka. Kyojin, aka Tokyo Giants, as in Kyojin, Taiho, Tamago Yaki, the rallying cry of the Seventies that would propel Japan to economic preeminence in the Eighties, is Nagashima and Oh. But, unlike Oh, Nagashima never left the Kyojin, something that’s heart and blood stuff to a Kyojin fan. Still, I take Oh-san. World Baseball is beyond borders and no Japanese player, and I mean no disrespect to Nagashima-san, has the international renown of Sadaharu Oh. When I was riding my own baseball crest in and around Southern California’s orange groves, Oh and his home runs were the sound of baseball from faraway Japan. If a photo did surface, it was of Oh and his flamingo style at the plate. Oh was the face of Japanese baseball to the world. “Wow, this is way up there,” I think to myself. So I do what men throughout the planet do when they feel their best, I phone my wife. I’m sure she’s glued to a TV set in Japan, where she and my youngest son are visiting her parents. Damn. I’ve been found out. Daisuke Matsuzaka, the young fireballer from the Seibu Lions, is at his best. 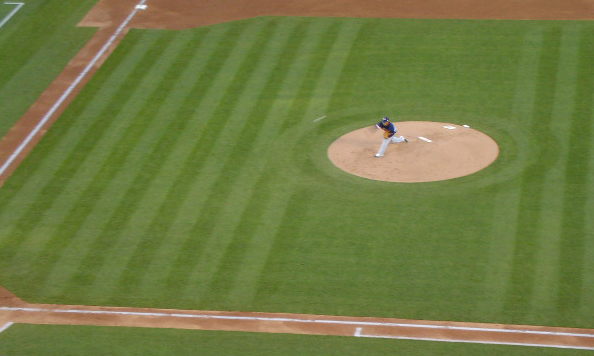 The scoreboard shows him with 69 pitches – 25 balls and 44 strikes. He’s throwing a masterpiece. I’ve watched Matsuzaka since he played in Koshien, the national high school tournament held every August in Osaka. The top teams from Japan’s 47 prefectures are represented and the single elimination games are all shown on national television. Koshien gets its name because the games are held in Koshien Stadium, the home to the Tokyo Giants’ arch rival, the Osaka Tigers. It is such an honor for a Japanese high school baseball player to play in Koshien that the losing team, immediately following the game, can be seen on their knees, scooping infield dirt into a small cloth bag. For the rest of their lives each player’s bag of dirt from Koshien will be displayed in a place of honor in their family’s home. Ichiro’s family has his bag. Hey, speaking of him, where is Japan’s most loved yakyu senshu? Where is Godzilla? Where is Matsui? Last year, during Sakura, my wife, our young son, and I cruised Kanazawa. What a time we had. Old town Kanazawa’s has one of my favorite izakaiyas. It’s in the main plaza, near the old shops. It’s small, just the way I like it. And the food is second to none. The family that runs it really has their act together. We spent a few nights there laughing, chowing down, and tossing back several Asahis. Not far from Kanazawa is Matsui’s furusato, his hometown, Komatsu. He along with Ichiro, Derek Jeter, and Omar Visquel, are my favorite major leaguers so I’m unable to resist the urge to pay the town a visit. I snap a shot of Matsui’s bigger than life photo in the eki, the train station. He’s Japan’s most loved player, the former star of the Tokyo Giants, the left fielder for the New York Yankees, and a no show in World Baseball. Come on Hideki, think. The world is a bigger show. Get it right in 2009! In the top of the 6th Oh-san applauds, signals to the home plate umpire that he’s ready, then studies Mexico’s new pitcher, Ortega. What a treat to watch Oh-san up close and personal. He’s baseball all the way and doesn’t miss a beat. He watches everything while standing at the end of the dugout closest to home plate. He regularly laughs and talks to the guy next to him. All the while his eyes are focused on the batter and wherever the ball goes. Oh-san is a class act. Ichiro steps in, locks his bat samurai style, and waits. It’s his field, his team, and his game. World Baseball and playing for Japan is Ichiro’s chance to again play yakyu, and he’s loving it. Ichiro is Hall of Fame in Japan, Hall of Fame in America, and Hall of Fame in the world. If there’s ever baseball on Mars, he’ll be Hall of Fame on Mars. When my oldest son was a small boy the offensive game I taught him was to find a way to get on base, steal, and score. You think I don’t love Ichiro? The game ends with Japan grabbing a 6 to 1 victory. Mexico showed and even had some moments, but Matsuzaka shut ‘em down. Considering America was to play Mexico the next day, and what goes down, Japan’s victory, in retrospect, seems prescient. What’s the deal with America? Nishioka did not leave early but Japan still lost the run, the inning, and perhaps the game due to an American umpire’s overrule. And it wasn’t close. Sadaharu Oh said it right, “I cannot understand how this could happen in America, the home of baseball.” Then, against Mexico, the same umpire let the Americans off the hook again by changing a Mexican player’s home run, a ball that clearly ricocheted off the right-field pole, to a ground-rule double. While watching America lose that game, my brother comments the American flag, on the right sleeve of the USA team, is on backwards. Sure enough, it is. We read left to right but they got it right to left. Since Bush showed, America can’t seem to get anything right. I could have made Japan-Korea the next night in Anaheim. It would have been great. My brother and I, however, went east, below Mt. Baldy, and played golf. I may have loved watching World Baseball live but playing golf, well, that’s different. I get the chance, I play. We watched Japan-Korea later on tape. Overall the Koreans were the best team in the tournament. Six wins. No errors. A staff ERA under 2. You love baseball, you love Korea Team. The ending to World Baseball 2006 couldn’t have been better scripted or more bizarre. Japan is out of the tournament before America gives the Nishioka game back by losing to Mexico, 2-1. In the semi-final game, a revived Japan plays the undefeated Korea team for the third time. Behind the pitching of Kouji Uehara, whose wife gives birth to their first child during the game, the Japanese finally win. In the other semi-final game, Cuba, the controversial team that America’s right-wing tried to keep out of the tournament, rolls over a Dominican Republic team heavily laden with major leaguers. In the final, Cuba is favored but Japan jumps out early and Matsuzaka again pitches a gem. Japan is crowned champion of the world. Unbelievable! My lasting memory is of a beaming Oh-san shaking hands with a long line of respectful Cuban players. It’s a big moment for the famous Sadaharu Oh. It’s a big moment for baseball. Two days after Japan rocked the world I’m on board an ANA jet heading to Narita and a reunion with my wife and youngest son. For me, World Baseball started with Jimmy Lefevbre’s China Team in the sands of Arizona and ended with Sadaharu Oh’s Japan Team winning over the world. Other than some of the umpiring and the bogus attempt to keep Cuba out of the tournament, World Baseball was a refreshing reminder of what baseball is, and always will be … People sharing a love of playing ball. Throw in childhood memories, moms, and dogs, and you tap the raw emotion stuff. World Baseball was long overdue. I’m just happy it showed on my watch.